BOSTON – The entire South Boston community continues to mourn the loss of a beautiful, young boy in our neighborhood, Colin McGrath, due to a tragic crash recently at L & 6th St. I can’t imagine the loss that the McGrath family is experiencing. Our town remains heartbroken and we keep them in our thoughts and prayers during this difficult time. In order to show respect and allow our focus to remain with the family, I refrained from discussing this topic during the period of mourning and until the funeral had passed. South Boston has certainly changed over the years, but one thing that will always remain is the spirit and kindness of its people. That much is evident by the outpouring of support for the McGrath family, the blue ribbons all over town, the volunteers at Gate of Heaven Church, the donations made by our local businesses and those made to South Boston Catholic Academy in memory of Colin McGrath. In times of crisis, we stick by our friends and neighbors. We are compassionate people. To those of you who contacted my office about pedestrian safety issues that are prevalent throughout South Boston, thank you for your passion, advocacy and feedback. I spoke with many residents on the phone and via email, along L St and at the Monsignor Powers building, and at neighborhood office hours at the South Boston Library. Your comments and advice have been helpful in reinforcing my thoughts and shaping new ideas. It doesn’t matter if you have been here 50 years or 5 months; if you’re a senior, disabled, a parent, or a child- we all know that our roads are unsafe. We’ve all witnessed speeding cars on our streets, fire trucks not being able to get to calls due to double-parked cars, blocked intersections by cars not properly parked; causing pedestrians to weave through vehicles to cross the street. 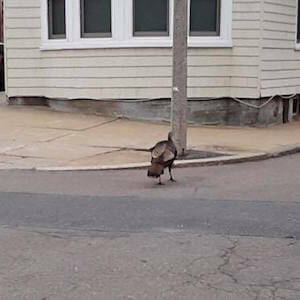 Many times, I’ve had to dodge vehicles while crossing the street in South Boston. I’ve had too many conversations with friends about near misses and crashes. My elderly parents often walk around town with my special needs nephew. Hardly a day goes by that they don’t tell me about a car that has blown by them in the crosswalk. My kids, Caroline and Stephen, tell me the same thing coming from the street hockey courts or the South Boston Library. In June, I met with neighbors following a crash at Farragut Road and Broadway to talk about pedestrian safety. We discussed these very same issues and helpful traffic calming policies. I also met with Boston Transportation officials about that crash and offered recommendations. Cars continue to speed through our streets, block our intersections and create difficulty for pedestrians to gain access to crosswalks. We have double-parked cars and delivery trucks on West Broadway, adding congestion and treacherous routes for pedestrians, other cars and buses. We see vehicles driving the wrong way on one-way streets. Ride-sharing companies can be unfamiliar with our roads, some inconsiderately stopping right in the middle of busy streets. We have distracted drivers texting and distracted pedestrians buried in their phones. In order to fix the problems at hand we need to recognize and acknowledge them. Drivers and pedestrians alike must always show common courtesy, respect, awareness and concern for each other. We all can be better. And I respectfully ask all of us to take it upon ourselves to make our streets safer. To improve pedestrian safety in South Boston, we all need to work together to slow down traffic and increase our awareness of others on the road. It will take all of us as a community to implement traffic calming policies to help try and realize Vision Zero. It will take the work of engineers at our transportation departments, along with public works, to apply physical changes to make our roads safer. It will take consistent enforcement by the Boston Police and the MA State Police. It will also take drivers and pedestrians to be respectful and aware of everyone on our roads. I provided suggestions to transportation and city officials regarding a number of traffic calming measures to be implemented at high-traffic locations throughout South Boston. I have described these measures below. In addition, I’ve included others from concerned residents. Moreover, I would like to see the speed limit reduced to 20 MPH in South Boston. 25 MPH is simply too fast for our streets. Please note the City of Boston and your elected officials will hold a meeting to address long-held pedestrian safety concerns at the Tynan School Thursday, August 9th at 6pm. 1. A complete traffic study of South Boston and all high traffic roads. 2. Reducing the speed limit to 20 MPH throughout all of South Boston. 3. Speed humps (permanent or temporary to move for plows) and raised crosswalks along L St and other high traffic roads, near parks and recreation centers where children and seniors gather. 4. 4-way stop signs along L St and relevant locations throughout Southie. 5. Additional posting of Speed Board Signs on high traffic roads throughout South Boston for feedback to reduce speeds. 6. Blinking Pedestrian Crossing signs at high traffic areas like we have on Summer Street. 7. Bumping out our sidewalks at crosswalks on Farragut Road, school zones and elsewhere to shorten crosswalks, make stop signs more visible & narrow our streets to encourage slower speeds. 8. Road Diets on Day Blvd, one lane from G St to O St, and speed humps in appropriate locations. 9. Increased police patrols in order to reduce speed. Increased fines for driving the wrong way on a one-way street and trucks on Day Blvd or L St.
10. More delineators in high traffic areas reminding to stop for pedestrians; paint in the roads advising drivers to slow, yield and stop. 11. A Study to determine if our numbered streets would become safer if they became one-way streets. An examination of data from the winter of 2015. 12. Designated time and space for delivery trucks on East & West Broadway to eliminate double parking. I hope these suggestions have merit as we all look to do our part to prevent serious crashes in the future. I realize some may not agree with these, but please know I offer these recommendations with public safety and Vision Zero in mind. The South Boston elected officials have been in constant contact with Mayor Walsh on this issue. I will continue to work with the Mayor, our city and state departments, Councilor Flaherty, Congressman Lynch, Senator Collins and Clerk Donovan on this critical issue. I welcome your thoughts on what we can do to make our streets safer. Please call my office at 617-635-3203 or email ed.flynn@boston.gov. A very thoughtful response. I just feel like all the statements being made by the elected officials using words like “I am recommending” (above) and Nick Collins saying he “continues to fight for” etc. …these two are good people and I know they do care about this however it begs the question WHO is the DECISION MAKER on this? Specifically WHO are these recommendations being made to and Who are you fighting with for this?………..There’s got to be 1 person that can simply say YES, we are going to do all of these within 60-90 days. That is what I am looking for. Is it the Mayor? Is it the DOT commissioner, someone else? We need to hear a YES—this is getting done and put an aggressive deadline on it. 100 % RIGHT Eleanor..ACTION, NOT talk..or your out of office…no more ” recommendations ” ., studies..ect.. So, we can use that $25M NOW to pay for this right? No mention of curbing development. How about a moratorium on new construction until this is figured out? With new units comes more people, cars and chaos. We were promised for years by the city that infrastructure and safety improvements were conditional to the development build out. Yet these improvements failed to materialize even as millions has been grabbed in escalating real estate tax revenue. All the while comprehensive transportation studies and engineering plans gather dust in the city files. Bravo to the residents now who are energetic and committed to seeing the improvements made with organizing efforts that I haven’t seen in years! Great ideas Ed. I am glad to see one of our elected officials taking action and being proactive. As far as I know, nobody has ever produced a list of ideas that can actually be implemented until you did. Thank you. For everyone who wants improvements now. Please consider Tactical Urbanism. Watch & start making changes tomorrow!! It’s a great plan and easily doable, but we must all do our part with common road courtesy and remember that these are our children, neighbors, elderly, and disabled that we should consider when we are behind the wheel! 20mph, why not 15mph? 10mph? 5? Any statistical evidence that 20 vs. 25 mph? What good are speed limits when cops don’t enforce? 18% likelihood of fatality or serious injury at 20 MPH. Will the meeting be lived streamed for the ELDERLY, and familys with young children..it should be at least recorded so the “proposed plans” are on record ant the politicians are held accountable for their promises..